After a heartfelt and passionate debate in the House of Commons, MPs have voted 330 to 118 to reject the Assisted Dying Bill. As many as 85 MPs spoke, sharing personal stories and compelling arguments both for and against the bill, which proposed that a terminally ill person should be able to request assistance to end their own life. The bill specified that for a person’s request to be granted, they must be terminally ill and “reasonably expected” to die within six months. Their decision would have had to be “voluntary, clear, settled and informed”, put forward in a written declaration signed by two doctors, and approved by a High Court judge. Only after a cooling off period of 14 days would a lethal drug have been prescribed. Here, two experts in medical ethics sum up some of the arguments for and against the bill. 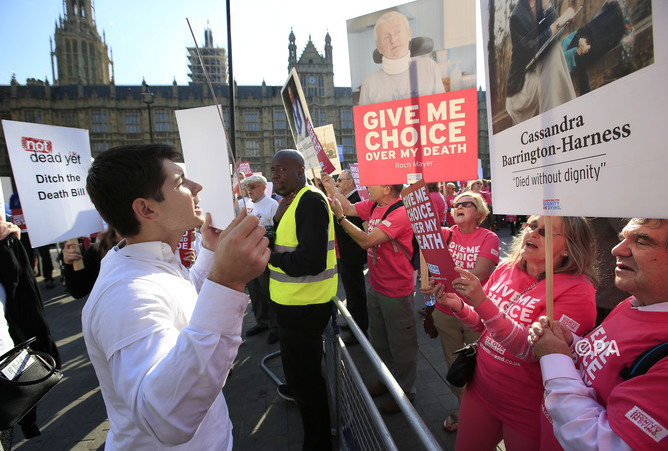 Protesters outside the Houses of Parliament in London as MPs debate and vote on the Assisted Dying Bill.